Calling all the babes out there who enjoy FUN! Come flow and indulge with us at the GLTR babes-only monthly clinic! After all the hard work, we know you'd love a relaxation, so this month let's dip into the Jacuzzi Tub! It’s time to unwind and recharge! Did you know: Health benefits of hot/jacuzzi tub include reducing stress and anxiety, ease muscle pains, improve blood circulation, lower blood sugar and blood pressure, and it can be relaxing and fun too! Schedule your Jacuzzi Tub slot anytime between 4.00pm to 8.00pm! 3. Photo ID for registration. 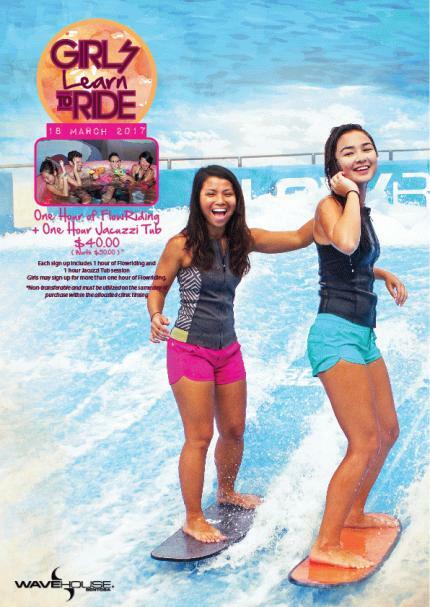 You are advised to arrive 30 mins before your flowriding session for registration purpose.